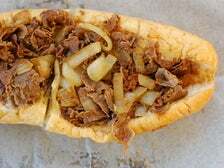 Cheesesteaks have clear ties to Philadelphia, where hot dog vendors Pat and Harry Olivieri were scarfing down links every night before switching things up for dinner one night. 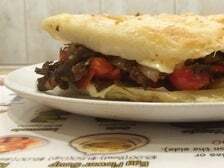 Their grilled steak and onion sandwich caught on with cabbies and Harry’s son Frank later added molten Cheez Whiz to the mix. Over the years, Provolone or American cheese have also become popular, as have peppers. 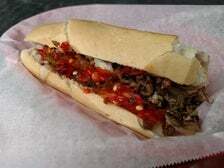 Now, the Philly original serves as a touchstone across cultures. 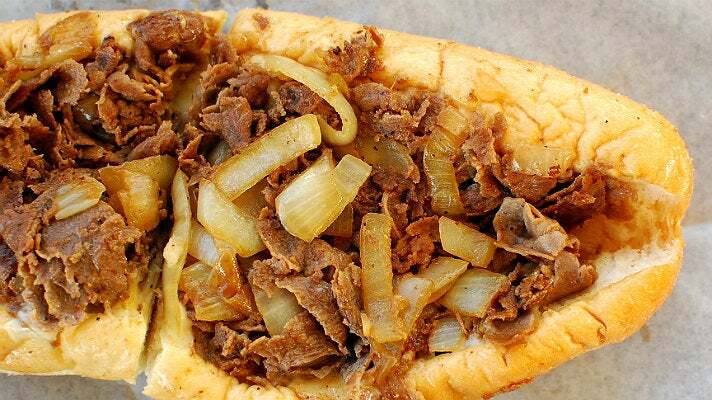 From traditional to otherworldly, learn about some of the best cheesesteaks in L.A. 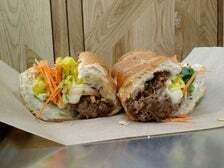 The back counter of an Alka Water market in Playa del Rey might seem like a strange place to find ambitious Vietnamese sandwiches, and it is, but ASAP Phorage makes it work. This fast casual spot by the beach builds on the success Perry Cheung and his partners achieved with Phorage in Palms. 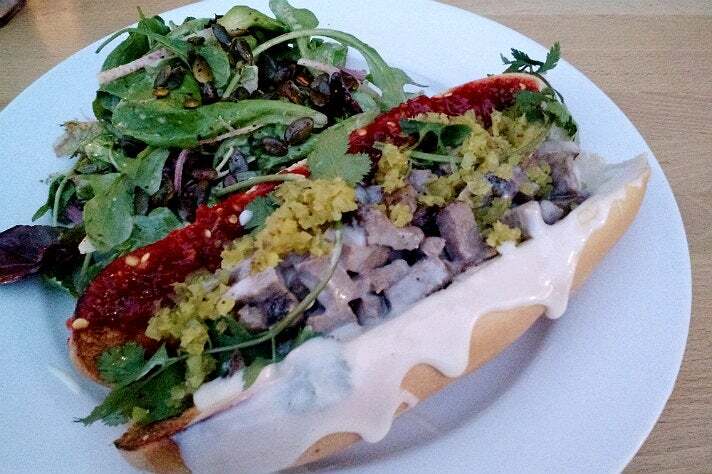 At ASAP, Chef Ulises Pineda-Alfaro serves a cheesesteak inspired by shaking beef, aka bo luc lac. 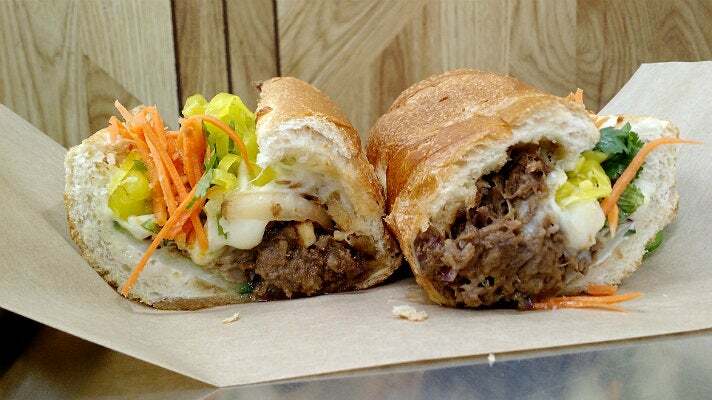 The Shaking Cheesesteak features brisket cooked in aromatic pho broth that’s deglazed with sweet soy sauce, topped with pepperoncini and piled into a soft baguette with a blend of Manchego, Provolone, Jack and Swiss cheeses. Better yet, this juicy beast is available with two house-made sauces: smoky Sriracha with six Chiles, or spicy green Serrano jalapeño. Inside Chef José Andrés’ multi-faceted gastronomic pleasure palace, which he runs with glitzy SBE, not every bite will break the bank. For instance, one of their modern plays on popular comfort food includes a fun riff on a “Philly cheesesteak.” Chef’s team pipes football-shaped “air bread” with sharp, oozing Fiscalini cheddar espuma and tops matters with seared Wagyu beef, sweet onion jam, a drizzle of olive oil, chives and sea salt. Andrew Ahn and his Korean American family honor their grandmother "Boo", who used to live in Philly’s Olney neighborhood. They initially launched in a Silver Lake A-frame and added a Koreatown branch in 2013. 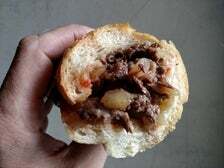 The Ahns previously lived in Philly, so they know cheesesteaks, which start with Amoroso’s famed feather-light rolls, and of course, star juicy griddled beef. It’s your call whether to order your sandwich “wit” Whiz, American or Provolone cheese. Options include grilled onions, pickled chile peppers or mushrooms. The atmosphere is a bit better in the Silver Lake location, which has patio picnic tables, an airy interior and wall-mounted pennants that champion Philadelphia’s hometown Flyers, Phillies, 76ers and Eagles. Since 1992, Jake Lodish has been “serving the East Coast to the West Coast” in a homey shop along Little Santa Monica Boulevard in Beverly Hills. The space features black and white checkerboard floors, white stools at black-topped wood counters and a handful of metal sidewalk tables. 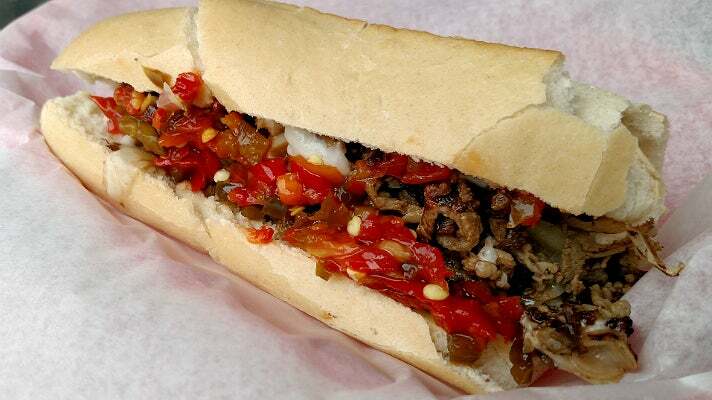 Papa Jake’s cheesesteak showcases griddled ribeye, provolone, sautéed onions and hot peppers. You can also get lettuce, tomato, sweet peppers, sauce, mushrooms, bell peppers, and this being California, avocado. No matter what you order, expect airy rolls with delicate crusts from an Atlantic City bakery. Owner Mark Lifland is from Allentown, Pennsylvania and migrated west to preach the cheesesteak gospel. Philly West Bar & Grill has been in the same place since 1992, with two previous locations. 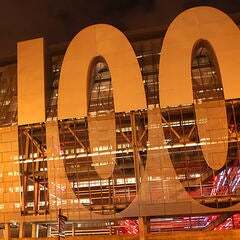 The bar features framed photos of Philadelphia sports legends on the wall, including Chuck Bednarik and Dr. J. Their cheesesteak logo wears a Phillies hat and shades. Lifland clearly doesn’t take himself too seriously, but he does serve serious cheesesteaks. Thin-sliced ribeye joins grilled onions, a smattering of marinara sauce and white American cheese in a soft French roll with good chew. Mushrooms and peppers are also readily available. So is cold beer. This Hollywood legend dates to 1939 near the corner of La Brea and Melrose. 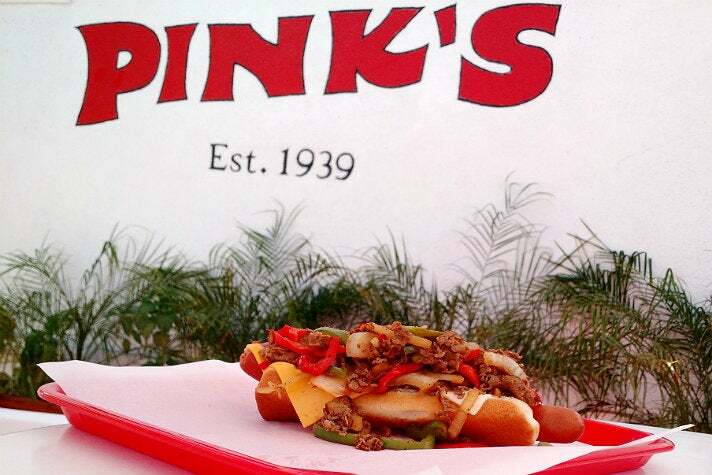 Paul Pink started with a hot dog wagon. He and wife Betty graduated to this stand in 1946, which has a red and white color scheme, plenty of neon, a relaxing back patio and near-perpetual lines. The walls showcase signed photos of famous customers, including Sugar Ray Leonard, Richard Simmons and Will Ferrell. Of course their Philly cheesesteak comes on top of a Huffy dog. That’s right, Pink’s piles grilled steak, peppers, onions, American and Swiss cheese on a hot dog, which is basically a double bonus. This Mar Vista rotisserie-focused eatery from chef-owner David Kuo and wife Maki became a quick hit in 2014. The entrance resembles the House of Black and White on “Game of Thrones,” with black on the left and white on the right. A rotating sign above the restaurant features a row of key ingredients, including chicken, cow, carrot, pig and sheep. Sidewalk tables look out to the Sunday farmers market. 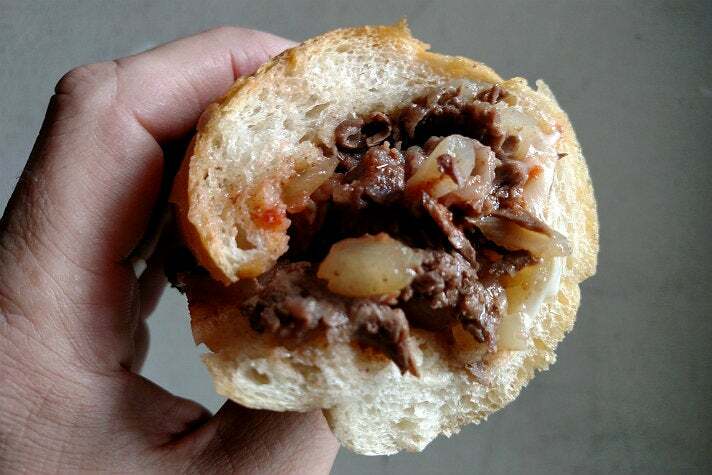 The Taiwanese Philly Cheesesteak draws on Kuo’s heritage. He simply seasons rotisserie tri-tip with salt and pepper. Cubed meat arrives in a sturdy French roll with minced pickled mustard greens, spicy sambal and a silky sauce crafted from Cabot sharp one-year cheddar, Pecorino and milk. The patriarch of L.A.’s Mongolian BBQ scene dates to 1973 in a strip mall near LAX. 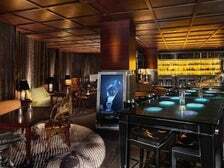 A convex grill and pagoda wallpaper are the standout design elements. Beyond that, it’s all about the Mongolian buffet - except when it’s not. 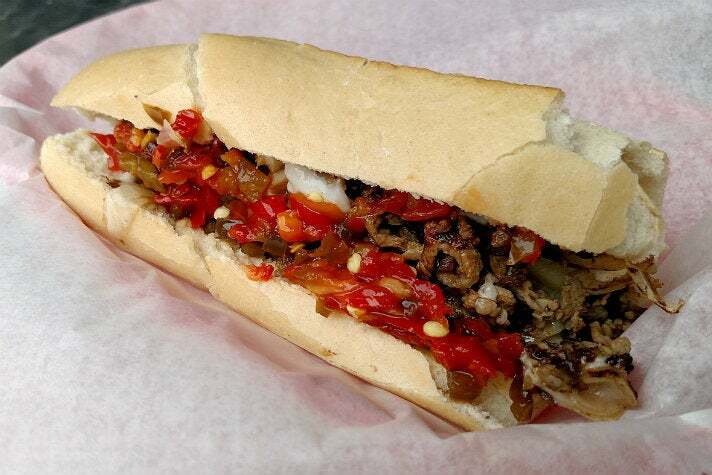 Three Flames offers one outlier that warrants your attention, the Mongo cheesesteak. 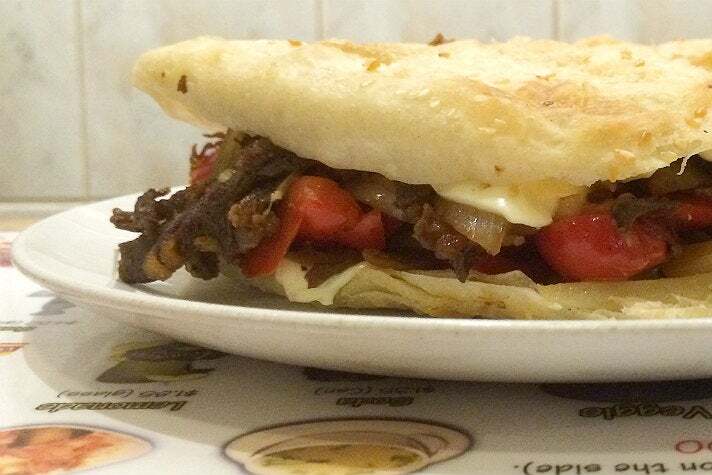 In this case, they pile beef ribeye, mushrooms, bell peppers, onions and slices of American cheese in flaky, sesame-studded shao bing (pocket bread). This "chef-driven fast food" concept from Chef Steven Fretz, Anthony Carron, Noah Ellis and Jamie Tiampo is destined for mass expansion thanks to their high-value sandwiches and custard shakes. 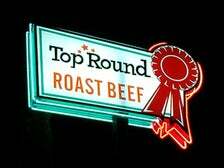 Their thin-sliced roast beef, which is slow-cooked for 12 hours but remains rosy, is the star of the show. The Beef & Cheese imparts a taste of Philly into a sandwich that could easily play well in upstate New York. 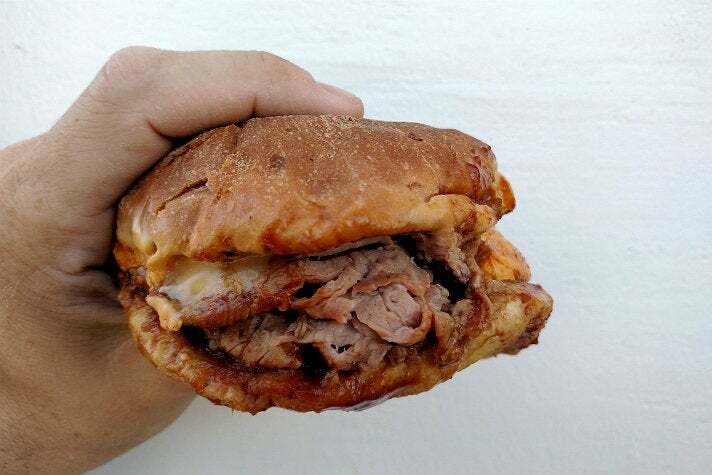 This variation combines roast beef with house made cheese "wizz," Round sauce and a seasoning shake on a soft, butter-toasted onion bun. Recipes for the Round sauce and wizz are both house secrets. 9527 S. Santa Monica Blvd.